I like to refer to this soup as “magic soup.” It feels like one gigantic bear hug and will warm you from the inside out. It’s soothing, comforting and every bite is a reminder that food truly is medicine. It’s amazing how simple ingredients can make your taste buds sing while your entire body fills with warmth and joy. As I sit and write this post the snow falls from the sky, the fire crackles in the wood stove, and the Christmas tree lights glisten in the dark living room. The farm kitchen smells amazing while this soup simmers on the stove. I’m reheating it for night two of “magic soup” and could not be more thrilled to dig my spoon into a bowl of this rustic stew for a second night in a row. I know there are a million and one recipes out there for red lentil soup but I gotta say, I think this recipe is pretty spot on. It could not be more simple but somehow these basic ingredients work together to create something extra special. I hope you all enjoy this “magic soup” as much as we do. It pairs really well with crusty bread and a glass of full bodied red wine. The perfect snowy night dinner! In a large, heavy bottom pan heat the oil over medium high heat. Add the onion and cook, stirring occasionally for about 4 minutes. Stir in the garlic, carrots and parsnip and continue to cook for about 1 minute longer. Add the tomato paste, spices and salt and stir to coat all the veggies in the mixture. Add 4 cups of the broth (reserving 1 extra cup to thin as needed) and the lentils. Bring the mixture to a low boil, reduce heat to medium-low, cover the pan and simmer until the lentils are tender and begin to fall apart, about 25 minutes. If the soup seems too thick add 1 more cup of vegetable stock (or water). Taste test and adjust seasonings as needed. Keep the soup on low heat until ready to serve. Drizzle in the lemon juice and cilantro and divide between bowls. Huge snow storm just blew through southern Ontario now calm with lots of fluffy snow and a big moon rising and all the while red lentil soup on the go what a great treat to come in to after shoveling! I want you to know that I made your mushroom and lentil stew as a Christmas gift for a vegan friend who leads a very busy life. The recipe made 5 generous portions, at least as I made it. I don’t have a review from yet from my friend, but my sister taste-tested it, and she thought it was very good. Thank so much. Wishing you and your family all the best for the holidays and the New Year. Sounds yummy! You must grow your own cilantro indoors to have it fresh while snowed in. I love it, but can’t grow it. this soup was really lovely. 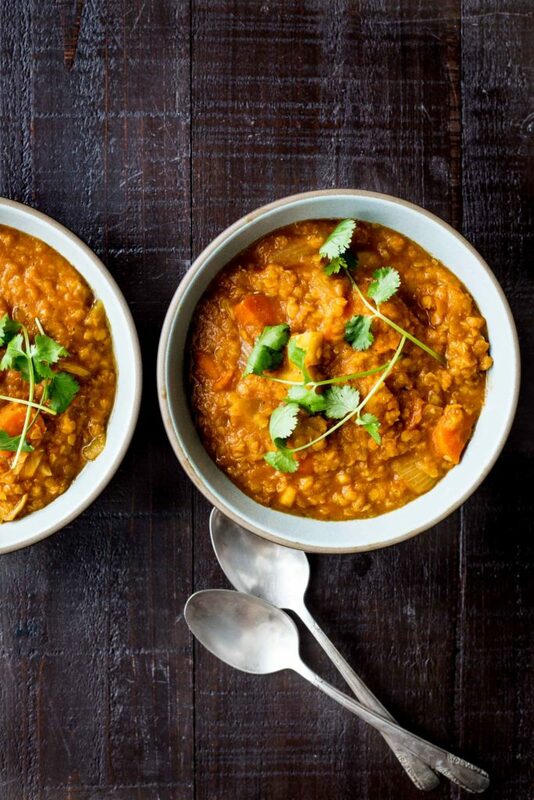 One of the best red lentil soups ever, and I’ve had a few… Thanks for yet another fab recipe! This is the fourth recipe of yours I’ve made in the last 1.5 weeks and it’s just as amazing as the last three! Thanks so much for brightening a winter’s day. I’ve made this soup three times since the recipe was posted. It’s become a go-to for work lunches (very filling with a bit of rice or baguette). The last two times I made it with red Thai curry paste since I had some to use up and it was delicious. This time I made it as written, which I am sure will also be delicious!